Battery life is very short when using the convenience features on the camera like WiFi. 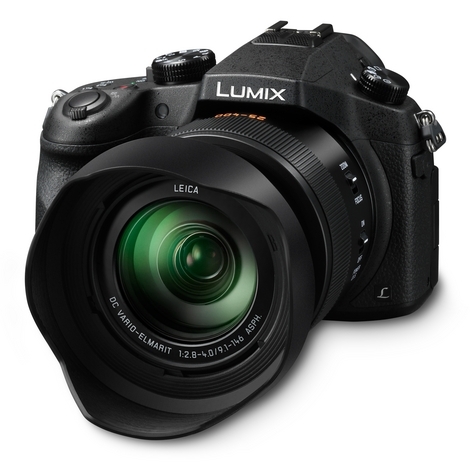 The Panasonic Lumix FZ1000 is a versatile and more than capable alternative to a dSLR or ILC. Fantastic image quality and performance will draw you in, while a great set of features and creative shooting modes will keep you trying new things. The camera also features powerful video capabilities including 4K video capture! Read more in our Full Conclusion. Back in June of this year (2014), Panasonic announced the Lumix DMC-FZ1000 -- the world's first digital compact camera with the ability to record ultra high definition 4K video (previous 4K models had interchangeable lenses). At the heart of the FZ1000, you will find a 1.0-inch 20.1-megapixel High Sensitivity MOS image sensor designed to improve the camera's signal-to-noise ratio. Part of this noise reduction is thanks to pixel density; the rest is handled by the Venus Engine image processor and its multiple built-in Noise Reduction systems. The Venus Engine also makes this camera super quick. It can start up in 0.66 seconds, while Auto Focus times have dropped to as little as 0.09 seconds using Light Speed AF thanks to "Depth from Defocus" technology. The FZ1000 also features a 16x optical (25-400mm equivalent) zoom lens with an F/2.8-4.0 maximum aperture, a 5-axis HYBRID optical image stabilizer, and a 5-step speed control zoom to help with quiet, vibration free zooming during video recording. Framing and composition are handled on a 921K-dot 3.0-inch "free-angle" OLED Live View Finder. The LVF rotates to the side up to 180 degrees, and can tilt up or down by 270 degrees. The FZ1000 can record all types of video at various resolutions and speeds. QFHD 4K (3840x216) can be captured at up to 30 fps, while Full 1080p HD can be recorded at 60p or in a high-speed mode at 120fps for a "slow motion" effect. There are also Creative Video Modes -- such as Time Lapse Shot and Stop Motion Animation -- to play with. Finally, the FZ1000 comes with Built-in Wi-Fi and NFC technologies, which allow you to connect the camera to iOS and Android smartphones (and tablets) running Panasonic Apps. One such app, the Image App, lets you use your phone as a remote viewfinder, with access to the shutter release button as well as settings such as shutter speed, zoom, focus, aperture, and exposure compensation. The Panasonic Lumix DMC-FZ1000 sports a suggested retail price of $1,199 USD. See our best price box at the top right of this page for the most current online pricing.